WP Engine is a managed hosting provider focused solely on WordPress. 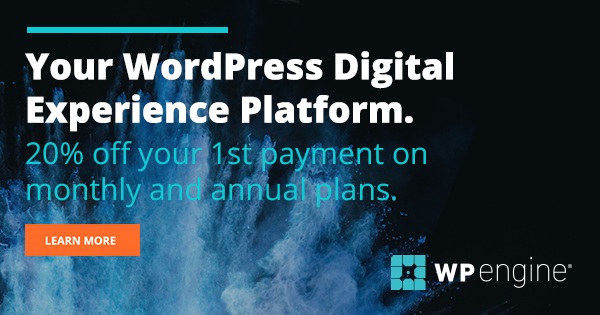 I have been developing WordPress websites on WP Engine for more than two years now and rely on their efficient features and fast speed, and have never looked back. I now recommend them in all my proposals as it benefits my clients financially and it’s just a great service. Best of all, WP Engine provides great tools for designers to easily setup their development environments – keeping myself, a designer, completely independent of my more technically-experienced engineer colleagues. Here is why I love WP Engine and cringe when our clients choose a different provider. A staging environment is a separate development area that won’t effect your public website, where you can make modifications to later be “made live” by deploying them to the production site. Before WP Engine, I leaned on my engineer partn Scott to setup a staging environment for me in AWS, which took about 45 minutes of his time to get everything setup. Once my designs were implemented and approved on staging, Scott would have to copy the content over to the public site, manually updating the wp-config file database connection, modifying htaccess permissions, fixing database entries, and fixing any absolute URLs linking to the staging site that were hard-coded by misbehaving third-party plugins. Deployments were done late at night and the process usually took an hour or two to complete with backups, content and database transfers, etc – and the site had to be down the whole time. Since this was such a pain, I never used the staging site again, inevitably editing the live WP site directly for any changes needed beyond the initial deployment. With WP Engine, all these manual migration issues vanished. Setting up the staging environment can be done with one click, and adding secure password protection is quick and painless. The best part is that I can work on staging and do deployments to the live site without Scott’s involvement. Deployments usually take a minute or two to push the content. We’ve used different WordPress hosting providers and had satisfactory results, however after using WP Engine, I’d never use a different hosting provider for WordPress again. It’s now painful to edit some of our clients’ websites that use different providers. From the backend tools to the front-end marketing site, everything runs quickly and smoothly. Setting up a CDN with their toolset improves the load times even further. When replacing a customer’s site with a new WordPress site, we want to preserve any of their SEO rankings, search index links, and external links from third-parties. This can be a trick when switching from a non-WordPress site to a WordPress site, because the URLs will likely all be different. In the past, I had to create a spreadsheet of all the URLs in the old site and map them to their new locations, and then hand this off to my engineers to write a bunch of custom redirect rules to guide all external links and search bots to the right places. With WP Engine, I am completely self-sufficient with this now. They provide a super-simple GUI for setting up all the redirects you need, with a handy cheat sheet of regular expression instructions I can use to even get a little clever with it…all without having to use SFTP, edit htaccess files, or worry about server restarts. Image caching: WP Engine’s proprietary caching technology has been working great for us and it removes the need to install a 3rd-party plugin. Updates are done on the backend and are automatic. SSL Certification: Adding SSL certification is super easy and just an additional $5/month. Website password-protection: Setup is as easy as one-click. No code necessary. Firewall protection and Malware Scan: These tools are one-click add-ons that can be requirements for certain customers. No more headaches choosing which plugins to use and figuring out how to get them configured. Sometimes when I’m designing a page, I’ll do it directly in the site editor. With WPEngine’s backup system, I don’t worry about breaking anything, because I can always roll back to a restore point, which only takes a minute to do. WP Engine automatically creates restore points each time you deploy or you can manually create them in their portal; adding restore point titles and descriptions when necessary. You can also use their Git integration to handle your own version control as well. They even do daily backups that are stored in a geographically separate location. This was recently utilized when a client’s staging site’s hardware failed at the datacenter and WP Engine quickly got everything running on new hardware. I probably wouldn’t have even noticed had they not informed me of the downtime. This is a level of service we’ve never seen with any other WordPress host. With so many third-party WordPress plugins out there, it’s not unusual to have conflicts between plugins, or to end up with a site that has so many plugins it grinds down to a slow crawl. WP Engine scans your site for unsupported plugins and security vulnerabilities behind the scenes. We’ve received notifications when we needed to update a plugin or upgrade to the latest version of WordPress, and we’ve seen their recommendations preventing us from using a plugin that would cause a performance problem or plugin conflict. 7. Manage multiple client installs with one login. Similar to another great web application Trello, toggling between client installs is done using a drop-down menu. There is no need to create separate login credentials for each client. I’m not one to call support every time I have an issue, so it has been nice that they have a deep library of common support questions in their database. The one time I needed to chat with a live human, it took less than 10 minutes to be connected and the support person walked me through the issues and even created a support ticket, which was resolved a few hours later. Full disclosure – I am a reseller partner. WP Engine makes it easy to manage multiple clients with a signal user login. That alone is enough to make me want to lead all our clients there. Getting a little referral fee makes it even better.